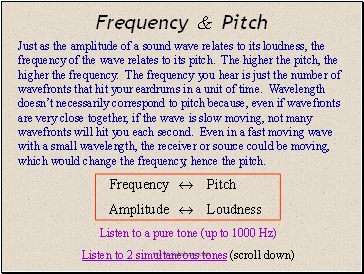 Just as the amplitude of a sound wave relates to its loudness, the frequency of the wave relates to its pitch. The higher the pitch, the higher the frequency. 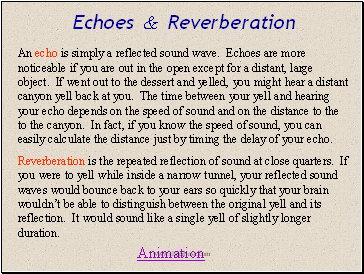 The frequency you hear is just the number of wavefronts that hit your eardrums in a unit of time. Wavelength doesn’t necessarily correspond to pitch because, even if wavefronts are very close together, if the wave is slow moving, not many wavefronts will hit you each second. Even in a fast moving wave with a small wavelength, the receiver or source could be moving, which would change the frequency, hence the pitch. The exterior part of the ear (the auricle, or pinna) is made of cartilage and helps funnel sound waves into the auditory canal, which has wax fibers to protect the ear from dirt. 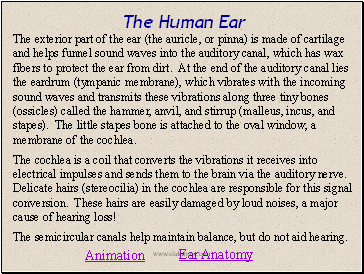 At the end of the auditory canal lies the eardrum (tympanic membrane), which vibrates with the incoming sound waves and transmits these vibrations along three tiny bones (ossicles) called the hammer, anvil, and stirrup (malleus, incus, and stapes). The little stapes bone is attached to the oval window, a membrane of the cochlea. The cochlea is a coil that converts the vibrations it receives into electrical impulses and sends them to the brain via the auditory nerve. Delicate hairs (stereocilia) in the cochlea are responsible for this signal conversion. These hairs are easily damaged by loud noises, a major cause of hearing loss! The semicircular canals help maintain balance, but do not aid hearing. 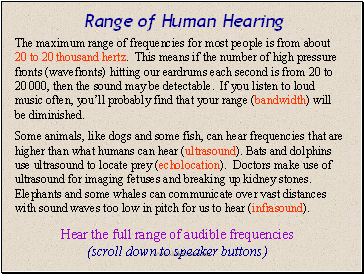 The maximum range of frequencies for most people is from about 20 to 20 thousand hertz. This means if the number of high pressure fronts (wavefronts) hitting our eardrums each second is from 20 to 20 000, then the sound may be detectable. If you listen to loud music often, you’ll probably find that your range (bandwidth) will be diminished. Some animals, like dogs and some fish, can hear frequencies that are higher than what humans can hear (ultrasound). Bats and dolphins use ultrasound to locate prey (echolocation). Doctors make use of ultrasound for imaging fetuses and breaking up kidney stones. Elephants and some whales can communicate over vast distances with sound waves too low in pitch for us to hear (infrasound).